Fire and smoke pose a serious threat to human life and health. Contrary to popular belief, over 90% of fire related deaths are caused by smoke suffocation, and not by high temperature or burning. Smoke also causes considerable damage to property. Applying appropriate smoke and heat escape systems can provide considerable help in preventing the dangers caused by high concentrations of smoke and heat. 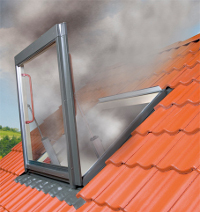 The smoke ventilation window FSP with a motor operated by smoke control unit co-operating with smoke sensor and alarm switch creates a so-called “smoke and heat carrying away gravitational unit”. The system is applied in public buildings (especially in stairways and in blocks of flats, hotels etc.). To install the system, it is necessary to connect 230V AC power supply to the smoke ventilation control unit, and, subsequently, through suitable cables to the remaining system elements. (Cable areas are contained in the table next to element names). The lengths of required cables depend on distribution of individual components of the system. 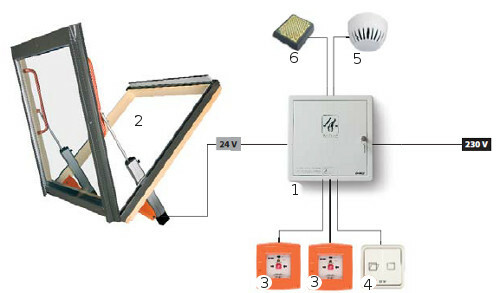 The wiring diagram is presented in the fitting instruction for the smoke ventilation control unit. Fitting the smoke ventilation system should be performed by a qualified electrician only (1kV qualification). The system should be tested for fault-free operation every 6 months. All elements of the system are certified and their application in buildings is authorised. building ventilation and automatic window closing after fixed time.